This week, the raptor was given its first run on the testing grounds. The Director of Enron Raptors, Hannah Wolf, came in to provide feedback about the progression of the prototypes. The electronics corner of which I reside was particularly swamped with growing concerns about what the future holds in store for prototyping. Nevertheless, enough feedback was captured between team and director to provide an adequate synopsis of the raptor development. For the claw appendages team, all was well and dandy. Most of the concerns laid in resting position of the arms, because the actors would have to hold these poses for ten minutes at a time. The arms could even rest on a support and have the hands dangle off. The next step for the claws is to reduce weight by removing unnecessary material and integrating with the skin. Overall, Hannah was very happy with the progress made on the hands. For the head team, lots of deliberation was focused on making the neck shorter and easier to control. The longer the neck, the more it starts to droop and become sluggish. Another topic of contention was the more curve-like basis rather than an angled one, which was a topic that popped up in the background frequently amidst frantic side conversations about wireless control and board selection. A large chunk of time was devoted towards the body, and for good reason. This is the component that supports most of the other components of the raptor. The legs looked good from the side, but from the front the width of the hips was a little too large, somewhere around 4-5 feet. 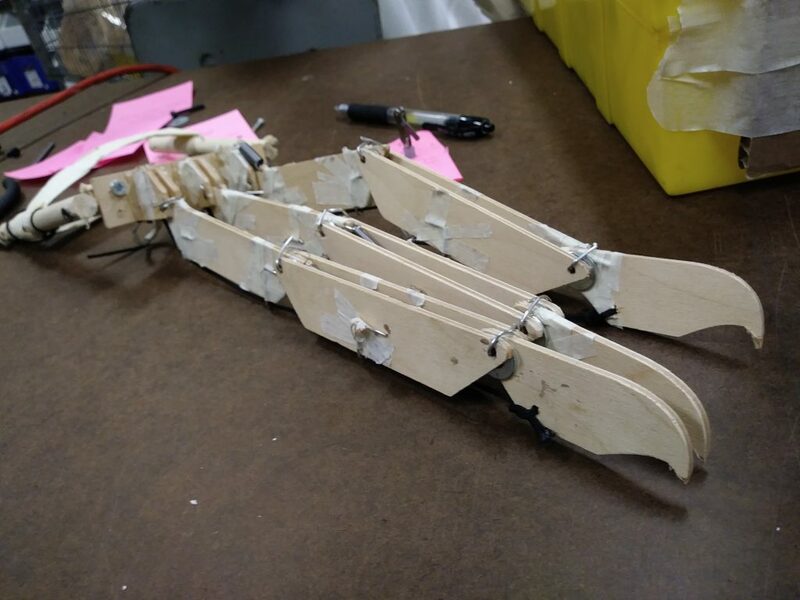 The original model was based off of a miniature raptor model, but the lead director gave some leeway in the creative process to shrink the width for maneuverability. The resting position of the actor in the raptor was slightly hunched over, with the feet at a standard human position. 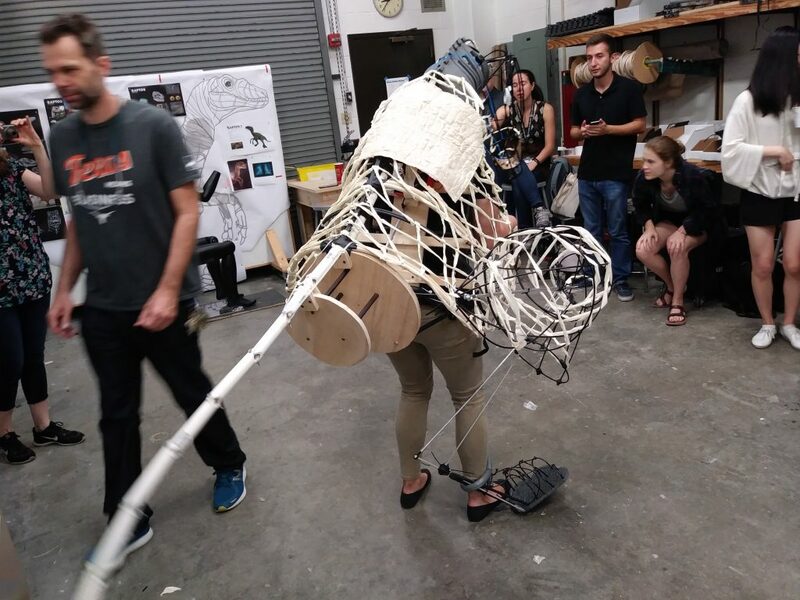 The prototype shown was designed so that the actor doesn’t have to crouch for long periods of time, but the director wanted the raptor to have a full range of translational motion, horizontally and vertically. Being slightly hunched leaves little room for a full height extension, so some adjustments are being considered to alleviate this issue and provide more vertical movement. As far as the feet position, Aaron Curry (Lighting Designer of Enron Raptors) demonstrated that the wider the stance is, the more the motion resembles waddling and bird-like behavior. The feet need to be able to versatile in placement and movement, but the major question at hand was how wide does the performer spread their feet? 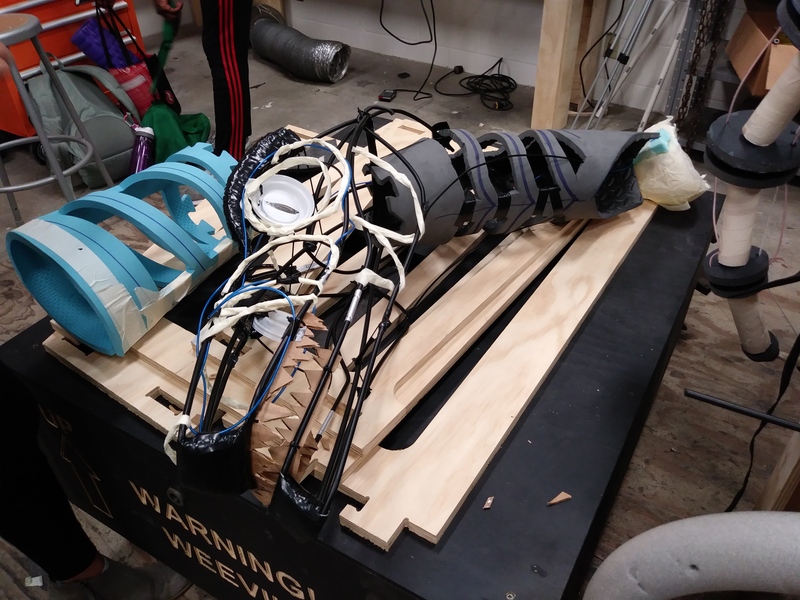 The raptor still needs to keep intimidation and the threat of rapid rushing, but the actor needs to feel stable and comfortable enough to move. The tail’s range of motion was a cause for concern, because collision with audience members was a very real possibility. The joints between the tail could be stiffened to limit the angular sweep, but a recommendation was made for fewer joints. The final decision consisted of longer joints near the base, and smaller joints as tail extends. In addition, the actor has a sense of the weight shifting with the tail movement, but has no sense of the location of the tail. 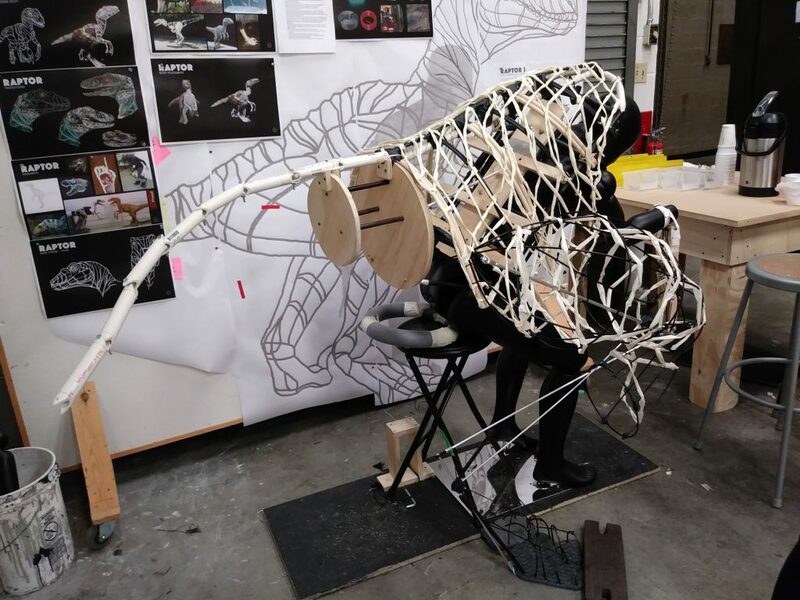 The tail is also the first place where skin will be integrated into the main raptor, because it is the closest to a finished product. For the electronics team, the director had no complaints or major criticisms about the power system or communication of electronics, which I suppose is a good thing. The point of this infrastructure is to discreetly provide the framework for the lighting to do its work. 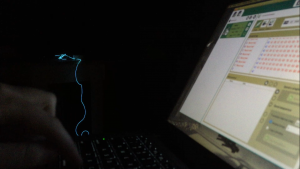 Both Hannah and Aaron had comments on the placement of the EL wire, and how it should resemble a raptor in the dark, akin to an outline. The angular vs. curved style came up again, with more of a preference towards angular. The lights represent life in the raptor, and the blinking was seen as a heartbeat. The two upper hands requested control of the heartbeat in each raptor, of which we grinned like fools and exclaimed that it could be done with certainty. The whole XBEE wireless communication was concepted for requests such as this. In fact, the electronics team recently got the XBEE system up and running after many frustrating and hairpulling hours. While the visit from the director may seem full of concerns and errors, Hannah and Aaron both spoke generally positive remarks about the progress of the raptors. As for my subteam, the electronics team still has quite a bit of work to do in terms of the prototyping path we want to take. The main goal is to be able to control EL wire for the veins and LEDs for the eyes all from one microcontroller, instead of having multiple consoles to manage for three raptors. Solving the logistics and framework of this takes quite some time and foresight, so our job is far from over.